You can change the projection mode to flip the image over top-to-bottom. 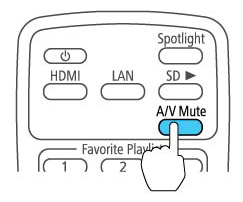 Hold down the A/V Mute button on the remote control for 5 to 10 seconds. The image disappears briefly and reappears flipped top-to-bottom. To change projection back to the original mode, hold down the A/V Mute button for 5 to 10 seconds again.